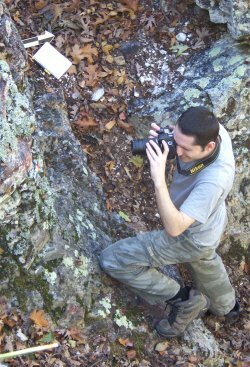 Tyler Stumpf photographs novaculite outcrop at quarry site. Hammerstones in a wide range of sizes were tools used to mine novaculite rock. Mary Beth Trubitt maps novaculite quarry site. Novaculite debris on surface of quarry site. 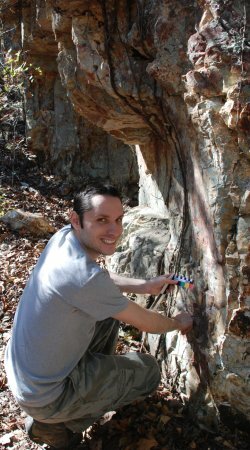 Tyler Stumpf documents novaculite outcrop in Garland County. This section of the website showcases novaculite quarry sites in Garland County. Photographs and descriptions of raw material from specific archeological sites are linked lower on this page. Our protocol for describing and characterizing the rock can be found on the “What is Novaculite” page. 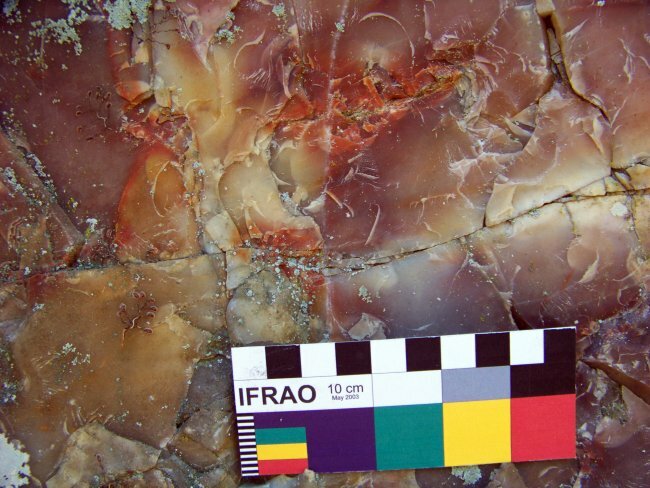 A battered outcrop shows colorful raw material at a Garland County novaculite quarry. Visitors to Garland County are impressed with the hot water coming out of the ground in downtown Hot Springs, Arkansas. Fewer are aware of the novaculite that outcrops as the Arkansas Novaculite Formation on mountain ridges across the county. In his 1919 treatise on stone tools made and used by ancient American Indians, archeologist William Henry Holmes described major chert and obsidian quarry sites across the United States. 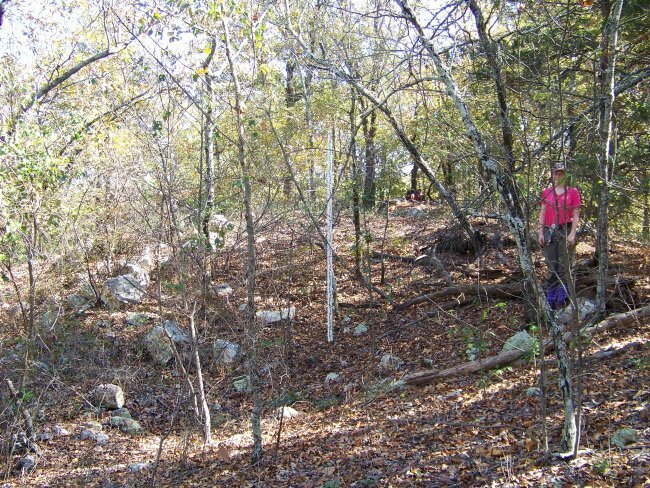 He highlighted two novaculite quarries in Garland County, Arkansas, now designated 3GA22 and 3GA48 in the Arkansas Archeological Survey’s AMASDA database. “The extent of this work is in several cases so vast as to fill the beholder with astonishment. In one place in Arkansas it is estimated that upwards of 100,000 cubic yards of stone have been removed and worked over,” Holmes wrote in an article published in the journal Science in 1892 (vol. 20, no. 512, p. 295). According to archeologist Meeks Etchieson, this would be the equivalent of 10,000 tandem axle dump truck loads! Novaculite quarries are some of the largest archeological sites in North America. 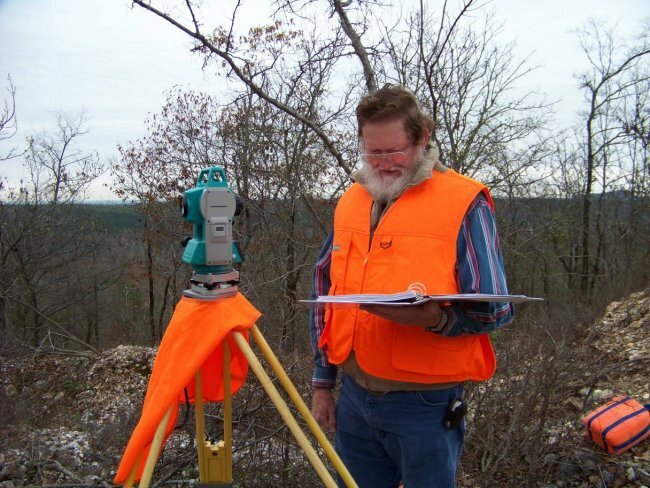 Meeks Etchieson uses a total station to map a Garland County novaculite quarry. These large-scale quarries are the focus of renewed research today. 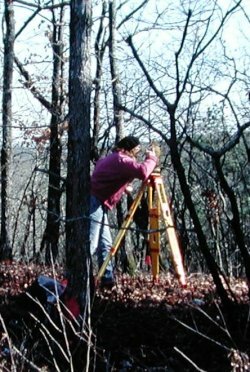 In 2002, archeologist Mary Beth Trubitt (Arkansas Archeological Survey) led a team that mapped a 5-hectare portion of one Garland County quarry. Assisted by Arkansas Archeological Society volunteers and students from Henderson State University, she created a detailed topographic map of the site showing aboriginal pits and trenches, worked and battered outcrops, and an extensive area of concentrated novaculite debris. A 3-dimensional view of the main ridge at 3GA22 shows the impact of aboriginal mining on the landscape. 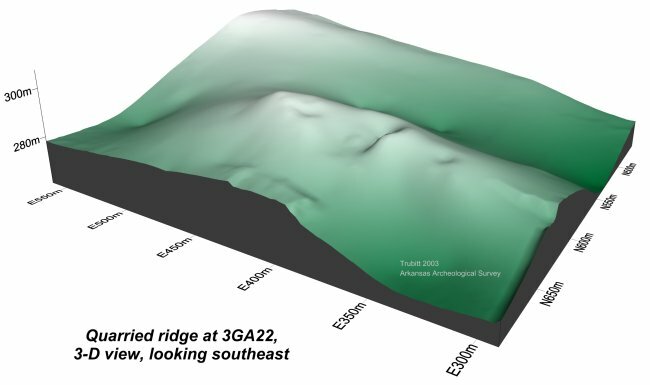 So much novaculite was quarried out of 3GA22 that about 100 meters (over 300 feet) of the ridge crest has been noticeably altered, as can be seen in the 3-D map view. Indians quarried rock here for thousands of years. A dart point fragment documented at 3GA22 provides evidence that people were here at least during the Woodland period (ca. 650 B.C. – A.D. 900). Finished tools are rarely seen at quarries. Instead, partly-worked pieces, flakes and angular debris, and hammerstones are the residues of this activity. In 1973, Charles M. Baker excavated a 1x1 meter test excavation at novaculite quarry 3GA48. He uncovered dense chipping debris in the small unit (recently calculated as 88 kilograms of chipped stone per cubic meter excavated). Refuse from initial chipping predominated and worked pieces of novaculite were few. 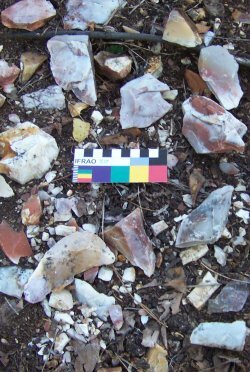 Based on two dart points (Marshall, a Middle to Late Archaic period type), quarrying was done at 3GA48 circa 4,500-1,000 B.C. Hammerstones are the tool seen most often at quarry sites. Hammerstones were used to break out masses of novaculite and flake it into manageable size for transport. Native miners brought cobbles of sandstone, silicified sandstone or quartzite, and syenite from river gravel bars to the quarries to use as hammers. 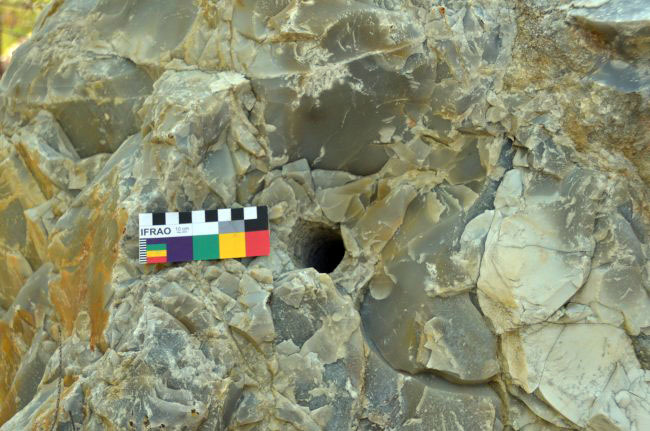 In the past, Native Americans dug large pits to reach useable novaculite rock. These features are still visible on archeological quarry sites today. Drilling and blasting were techniques used to break novaculite at 20th century whetstone quarries. For photographs and descriptions of raw material samples from Garland County, select a site below or go to the Comparative Collection page. Baker, Charles M. (1982) A Brief Study of the Arkansas Novaculite Quarries. In Fancy Hill: Archeological Studies in the Southern Ouachita Mountains, edited by Ann M. Early and W. Fredrick Limp, pp. 307-334. Research Series No. 16, Arkansas Archeological Survey, Fayetteville. Holmes, William Henry (1891) Aboriginal Novaculite Quarries in Garland County, Arkansas. American Anthropologist 4:313-316. Holmes, William Henry (1919) Handbook of Aboriginal American Antiquities, Part I, Introductory, The Lithic Industries. Bulletin 60, Bureau of American Ethnology, Smithsonian Institution, Washington, D.C.
Scarr, Kristin D. (2008) Trace Element Studies of the Arkansas Novaculite. M.A. thesis, Department of Anthropology, University of Arkansas, Fayetteville.